Young Pan is the spritely embodiment of youth and vigor. Standing in the fountain designed by Robert W. Brown, Young Pan is the carefree spirit of woods and fields, freely splashing in his pool surrounded by a pine grove. Gift of the Middle Georgia Art Association and the Artist. This kinetic sculpture by George Rickey is a focal point for the Museum grounds. 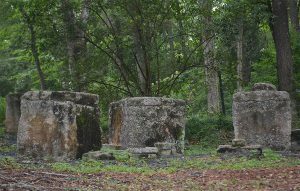 The sculpture consists of four trapezoids that form two rectangles when at rest. It is rarely at rest, as the trapezoids float, turn and move with the slightest breeze. Museum purchase with the funds provided by Texprint (GA), Inc. and Tokai Senko K.K. in celebration of their 10th anniversary in Macon, and matched with donations from the Museum Memorial Fund, the Fine Arts Committee, and the artist. 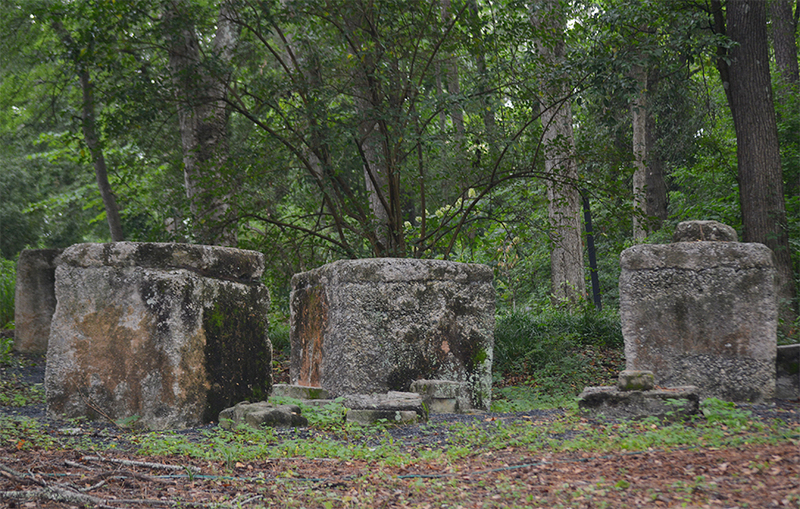 This series of concrete structures speaks to mythology and memory, recalling tombs of the ancients. Gift of the Artist. Built by Harry Stillwell Edwards and his son Jackson Lane Edwards. 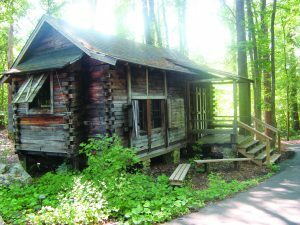 Noted Southern writer Harry Stillwell Edwards (1855-1938) built Kingfisher Cabin as a writing location on his property at Holly Bluff in 1928. 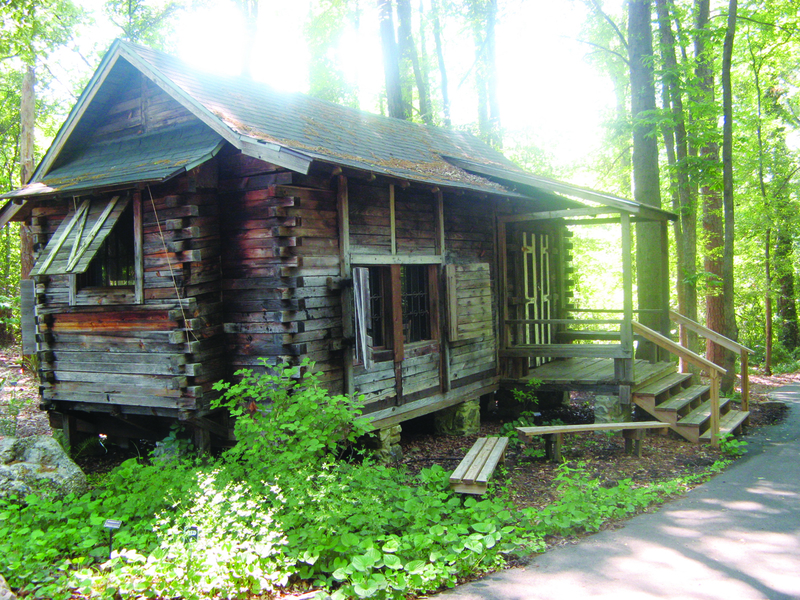 In 1941, the Cabin was relocated to Wesleyan College. In June 1964, the Cabin was moved to the Museum of Arts and Sciences and restored. The Museum restored the cabin again in 2006 as part of its 50th-anniversary celebration. Freya is a goddess of love from the Nordic culture. The building materials used are clay, cement, grout, and marbles. To begin, the wet clay is rolled into coils then connected and smoothed in the shape of an animal. The interior is left hollow. After the piece dries, it is fired in a kiln to the temperature of 1800 degrees. 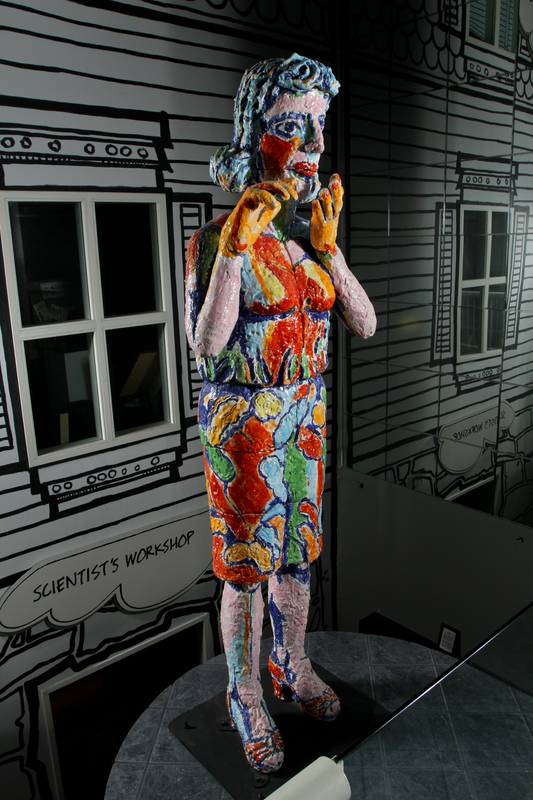 The sculpture is then covered with cement and marbles are imbedded. To finish the piece, grout is used to fill the spaces between the marbles. Gift of the Fine Arts Committee of the Museum of Arts and Sciences in memory of Joel W. Plum. 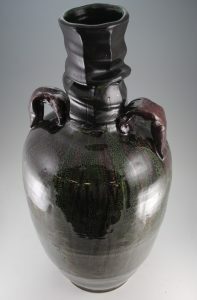 Low-fire whiteware body, commercial glazes. 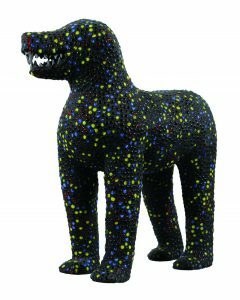 This piece was a Museum purchase with funds from the National Endowment for the Arts matched by the E.J. Grassman Trust and Georgia Pine Level Foundation. Purchased by Museum with funds provided by the Friends of J. Duffy Stubbs in memory of his contributions in support of the arts in Middle Georgia. Kirsten Stingle earned a Bachelor of Fine Arts from Ohio University in 1993 and a Master of Public Administration from Columbia University in 2000. She has exhibited widely in both solo and group exhibitions since 2009 and is represented by galleries in six states. Her work has won several awards including Best in Sculpture at the Four Bridges Art Festival (TN) and Best in Clay at the Atlanta Arts Festival. Dreamer was purchased for the Museum in 2014 with funds raised by the Fine Art Committee in honor of Cammie McCook. The sculpture is on display in a niche off the main lobby. Frank Vickery has been working in clay for 20 years with multiple years devoted to instruction in clay arts. 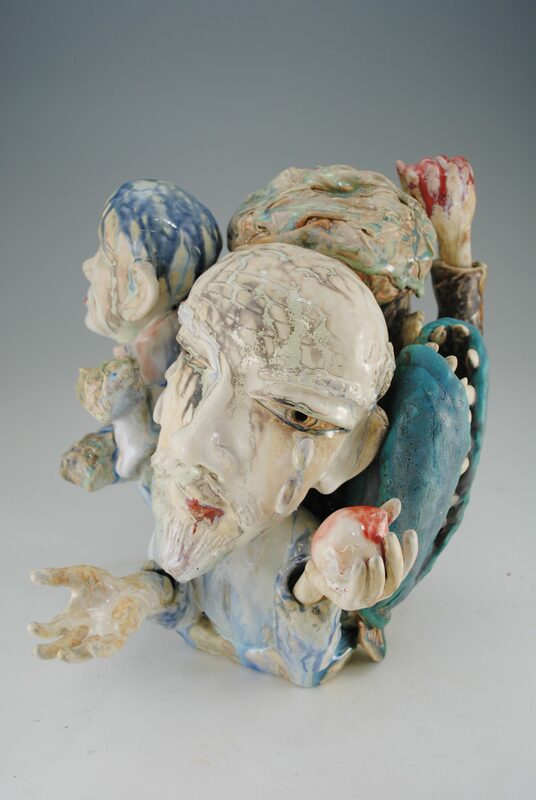 His personal works are concentrated in wheel throwing, but Frank also has extensive experience in hand building and creating and embellishing clay forms. Currently, Vickery is the ceramics program coordinator at The Bascom: A Center for the Visual Arts in Highlands, North Carolina, where he teaches ceramics classes. 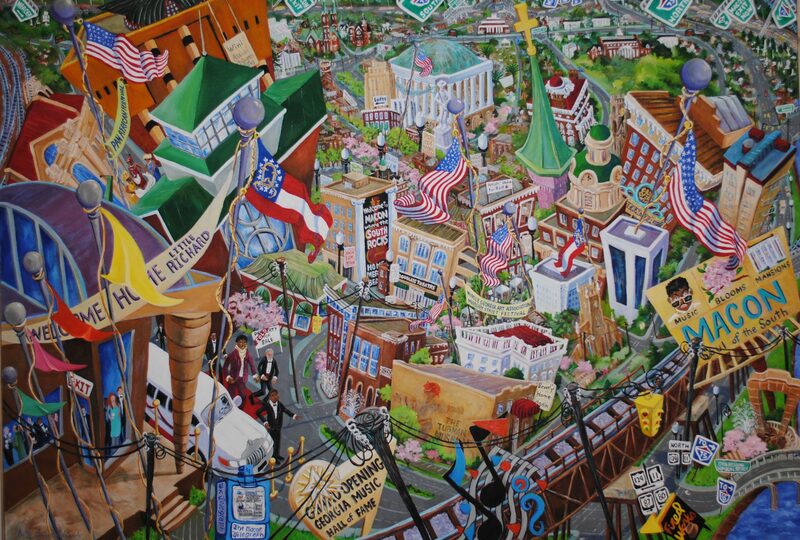 Frank started his career as a middle school art teacher in Rock Hill, South Carolina. He earned a Bachelor of Fine Arts and Bachelor of Arts in art education from Winthrop University, and a Master of Fine Arts at Western Carolina University in 2012. In “How the Arts Saved Macon,” Betty Bivins Edwards explores the role of artists in gentrifying areas of the city suffering from urban blight, their contributions unfortunately largely unappreciated. Steeped in the Southern legacy of storytelling, together with a sensitivity for place, Macon-based Artist Betty Bivins Edwards finds narration in art altogether natural. What she has to say about the South, however, is far from mere anecdote. Rather, in the tradition of her fellow Georgian writer Flannery O’Connor, she uses stinging wit and ironic humor to underscore the contradictions of a society clinging with only subliminal awareness to the assumptions of the past. This adherence to worn-out notions is all the more desperate; Edwards implies, because of the wrenching changes brought on by contemporary life. Edwards’ formative years were typical for women of her age and class. She graduated from Georgia College in 1967, majoring in mathematics and minoring in art. She then taught math and art in the Georgia public schools for several years. For twelve years in the late 80s and 90s, she taught painting and drawing at the Wesleyan College Center for the Arts. In the late 70s, Edwards began making craft items for friends and family. At about the same time, she “discovered” watercolor, captivated by its “immediacy and freedom,” producing beautiful landscapes of the Georgia terrain. 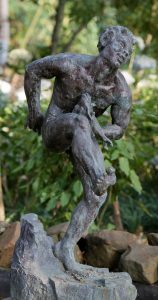 A summer studying medieval art and literature in Oxford, England, in 1983 was pivotal in sparking her development as a sculptor, a painter, and a printmaker. She has subsequently grown into a confident artist with compelling statements about the roles of Southern men and women in marriage, in religion, and in politics. 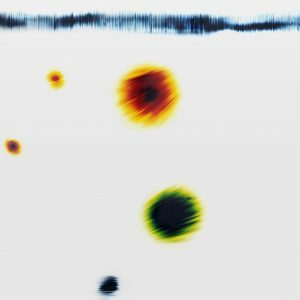 Through his chromogenic photograms, artist Richard Slechta uses light to record movement and time. These unique photographic images are made without a camera. The artist’s process begins with a painting, as he creates geometric compositions using permanent pigments over prepared acetate. Then, the artist uses the painting to filter direct points of light onto light-sensitive photographic paper. Working in a totally darkened space, Slechta moves light across the surface of the painting to expose portions of the photographic paper. The light, which travels through the painted pigments, is filtered in varying degrees by color, paint thickness, time, and distance to create the final photogram. Since the variables can never be duplicated, each piece is unique. Sunkoo Yuh was born in South Korea, immigrated to the U.S. in 1988, and now serves as Professor of Art at the University of Georgia. He earned a Bachelor of Fine Arts at Hong Ik University in Seoul and Master of Fine Arts at New York State College of Ceramics. Yuh’s artwork earned the grand prize in the 2nd World Ceramic Biennale 2003 Korea International Competition. Yuh creates ceramic sculptures comprising tight groupings of various forms including plants, animals, fish, and human figures. Korean art plus Buddhist, Christian, and Confucian iconography inform some aspects of his imagery but implied narratives that suggest a socio-political critique largely drive his work. Yuh’s interest in German Expressionist painting is evident in the elongation of many of his figures and his unsettling spatial configurations. 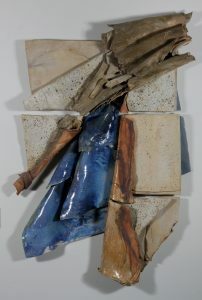 There is a post-apocalyptic sensibility to his sculptures communicated through his dense and dripping glaze (up to 40 layers), a technique that references Chinese Tang dynasty funerary sculptures, which Yuh admires. Alex Kraft creates forms that are individuals unto themselves, exuding their own life force. Floral and corporal systems are departure points for these imagined life forms and their environments. The forms are a revisualization of internal and external structures belonging to animal and plant bodies. The artist sees animals and plants made of matter (muscles, bones, stems, branches, etc.) and life energy. Originally from Tucson, Arizona, Alex Kraft earned a BFA in ceramics and BS in art education from Northern Arizona University in 2002. She earned an MFA from the University of Montana in 2006. 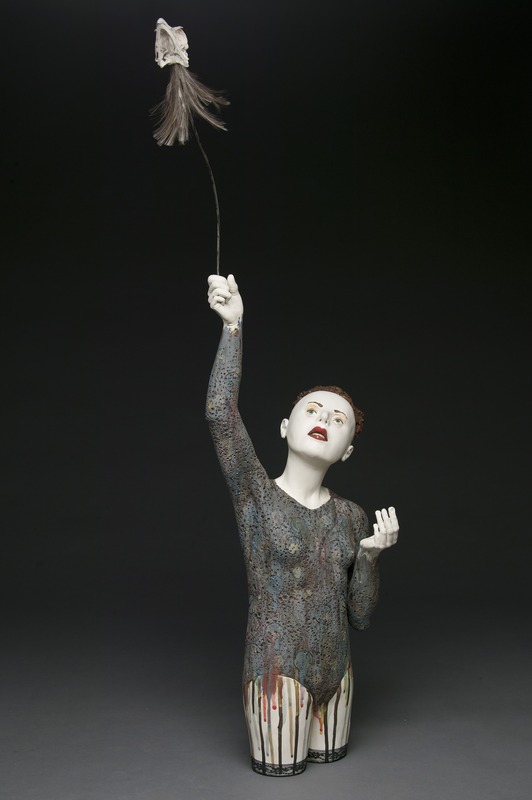 She has exhibited internationally and is an Assistant Professor at the University of North Georgia – Dahlonega, where she oversees the ceramics facility. Artist Alfred Conteh created this assemblage to honor his father, Alfred Nabbieu Conteh — the heart and soul of a family with lineage in America and Sierra Leone. 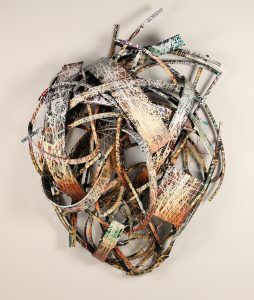 The artist chose to depict his father’s familial role as an actual heart constructed of wood and painted in patterns reminiscent of traditional cloths and quilts that his parents’ families have produced for generations. The constructed heart is not only an homage to the artist’s own family’s lineage and means of economic survival but also a reminder to his future sons and daughters of the cultural birthright for which they will be responsible. The geographic region of Sierra Leone also resembles the shape of an anatomical human heart, with the city of Magburaka centrally located in the middle of the country. Although the correct spelling of the city is MagBURaka, Alfred Conteh intentionally colloquialized the title of his assemblage to honor the local phonetic pronunciation of the region, which is MagBARaka. Atlanta-based artist Alfred Conteh employs a variety of media and styles in his paintings, sculptures, and mixed media assemblages. A significant goal of the artist is for his work to be a vehicle for thought and change. “By posing societal questions to the viewer,” claimed Conteh, “I rely on them to formulate their own opinion and answers about the work.” Alfred Conteh grew up in Fort Valley, Georgia; earned a BFA from Hampton University (1997) and an MFA at Georgia Southern University (2004). 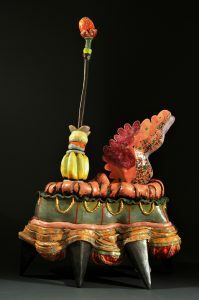 He lives and works in Atlanta, has exhibited extensively across the state, and is represented in numerous private and institutional collections.